312 pages | 17 B/W Illus. 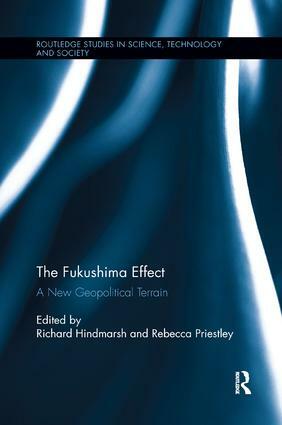 The Fukushima Effect offers a range of scholarly perspectives on the international effect of the Fukushima Daiichi nuclear meltdown four years out from the disaster. Grounded in the field of science, technology and society (STS) studies, a leading cast of international scholars from the Asia-Pacific, Europe, and the United States examine the extent and scope of the Fukushima effect. The authors each focus on one country or group of countries, and pay particular attention to national histories, debates and policy responses on nuclear power development covering such topics as safety of nuclear energy, radiation risk, nuclear waste management, development of nuclear energy, anti-nuclear protest movements, nuclear power representations, and media representations of the effect. The countries featured include well established ‘nuclear nations’, emergent nuclear nations and non-nuclear nations to offer a range of contrasting perspectives. This volume will add significantly to the ongoing international debate on the Fukushima disaster and will interest academics, policy-makers, energy pundits, public interest organizations, citizens and students engaged variously with the Fukushima disaster itself, disaster management, political science, environmental/energy policy and risk, public health, sociology, public participation, civil society activism, new media, sustainability, and technology governance. Richard Hindmarsh is Associate Professor in Griffith University’s School of Environment, and Centre for Governance and Public Policy where his research lies in environmental politics and policy, and science, technology and society. He holds a PhD in STS from Griffith University (Australia) and his previous book on this topic is Nuclear Disaster at Fukushima Daiichi: Social, Political and Environmental Issues (Routledge 2013). Rebecca Priestley is Senior Lecturer in the Science and Society group at Victoria University of Wellington (New Zealand) where her research covers science communication and history of science. She holds a PhD in HPS from the University of Canterbury and her most recent book was Mad on Radium: New Zealand in the Atomic Age (Auckland University Press 2012). Books in this series consider social science aspects of science studies. Authors discuss how science is socially situated and mediated, how science and technology are shaped by society and society by science and technology. Books will consider the social impact of new technologies.